Michael Ashcroft’s third solo show at the Lucy Mackintosh Gallery presents medium to large oil on canvas paintings, the inspiration for which is anchored in the world of Jack London and the wilderness of the American landscapes. The exhibition uses as its starting point London’s mansion “Wolf House”, as viewed from above. The fruit of the author’s labour was destroyed by fire before he could ever live there. Michael Ashcroft’s paintings go further in their exploration of this world, imagining back country adventures, rivers crossed and mountains climbed. Figures are removed but the sensation of a human presence still remains. Movement, the physicality of nature, trail dust and tracks in the snow. White water and rivers running. And also the myth of the hero surviving through strength and courage, and 1970s and 1980s “wilderness” thrillers, cinematic trials and cliché. It’s realism, grit, machismo. Safety and danger. 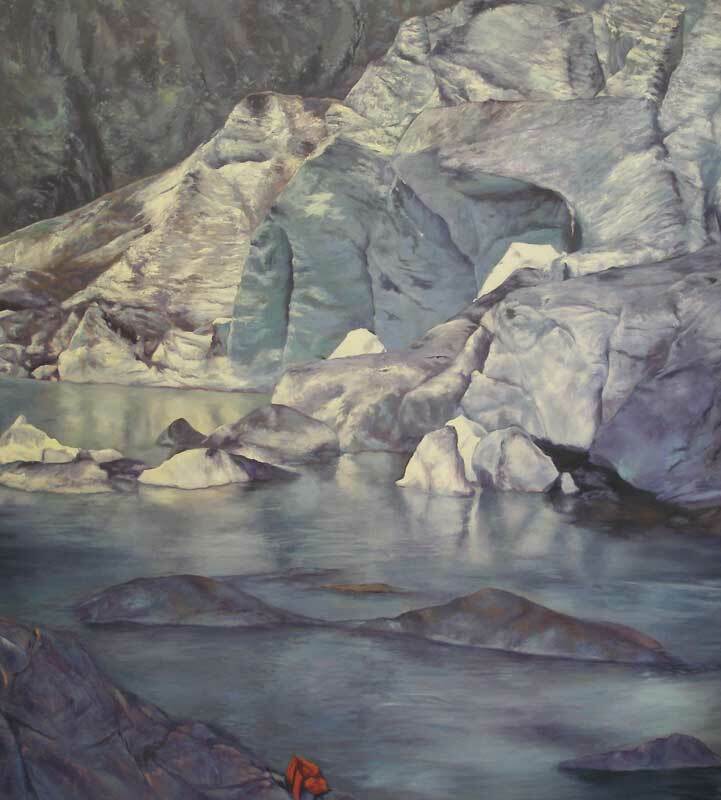 Ashcroft drew inspiration from the paintings of Courbet, Corot, Fontainebleu, Neil Welliver, and Beckman’s landscapes, as well as Scandinavian landscape painting. The mood hails from Americana and country music Gene Clark, Townes Van Zandt, and Neil Young. The raw material is vintage American hiking books of adventure trail hiking, about surviving in nature, displaying isolation and mental states excursions and hitchhiking. The intricacy and sum of Michael Ashcroft’s thorough researches is revealed in his paintings. Essentially, it is the artist in the landscape once removed, dislocation and alienation.